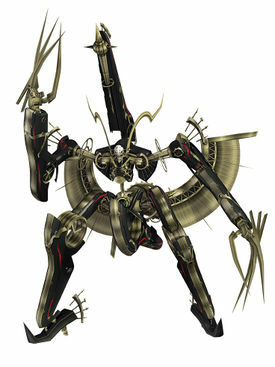 Official artwork of Metal Face from Xenoblade Chronicles. 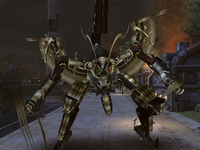 Metal Face (黒いフェイス, Black Face) is a major antagonist in Xenoblade Chronicles. Metal Face during the attack on Colony 9 in Xenoblade Chronicles. Metal Face first appeared in Xenoblade Chronicles during the attack on Shulk's hometown, Colony 9. He was immediately identified as the biggest threat, but nothing could be done to stop him; he easily destroyed all the weaponry used against him and killed many Homs, including Shulk's childhood friend Fiora, and displayed unusual-for-Mechon cunning and an immunity to the Monado (which is otherwise the only weapon that can harm Mechon, making him practically invincible). After the attack is over, Shulk leaves Colony 9 to chase him down for revenge. When they next meet, he shows that he can speak by taunting Shulk over enjoying his killings, and only leaves because of external interference. It is later revealed that Metal Face is a shell controlled by Mumkhar, a traitorous former war buddy of Dunban's who was presumed dead after the Battle of Sword Valley, and doesn't particularly care for the orders he's given as long as in the end he gets the Monado. Metal Face is a card-carrying villain, relishing in the pain and suffering he causes for its own sake. He openly gloats to Shulk and the others about the people he killed in front of them simply because he felt like it. Metal Face on Gaur Plain. Metal Face first appeared as a shadow at the end of Shulk's reveal trailer, teasing his role as the stage boss of Gaur Plain which was confirmed in the Super Smash Bros. for Wii U: 50-Fact Extravaganza Direct. Soon after night falls, Metal Face may appear. He can either appear in the middle of the stage and then perch between the two main platforms or fire his Custom Grand Shot at one of the main platforms making it fall down, thus destroying the platforms underneath, and placing himself on the fallen platform. Once positioned he doesn't actively chase fighters, but he tries to hit any close fighter with a claw swipe. If he is not defeated after enough time passes, he leaves the stage after performing a dashing strike across the horizontal length of the stage. When defeated, he will damage whoever didn't get the last hit as he bursts into a series of explosions and fall as a flaming projectile towards the bottom of the stage. Any other players near the explosions or falling Metal Face will take heavy damage and knockback. Metal Face will say any of a random set of lines while on the stage; however, he has special quotes directed at Shulk that only play if he is one of the fighters in a given battle. For a full list of quotes, see here. Metal Face appears as a random event: bumping into him will initiate a battle against him in Gaur Plain. If not defeated in time he flies to another spot in the map, but he retains any prior damage. Metal Face's trophy is part of the Mechonis Trophy Box. Metal Face trophy in for Wii U. A faced Mechon who appears on the Gaur Plain stage. He swoops in from the sky when night falls and then leaves with the break of dawn. He doesn't actively pursue fighters, but if you get too close, you'll taste the deadly bite of his claws. Watch out for his laser attack too-it can destroy parts of the stage itself! Metal Face returns as a stage boss in Super Smash Bros. Ultimate. He also returns as an enhanced Sprit which can be obtained by evolving a Level 99 Mumkhar Spirit. One of the tips in the Wii U version of the game mentions that whoever KOs Metal Face gets credit for the KO, like Ridley. This is likely a leftover from earlier in development, as it does not occur in the game. Metal Face also has an unused head icon in the same style as Ridley, suggesting that it was intended to be used like Ridley's when a player KO's Metal Face. It could also be referring to Smash Tour's boss bonus. Metal Face has by far the most voice clips of any non-playable character, and more than many Fighters, at around 60. Also, unlike many characters, his voice clips mainly consist of actual sentences and phrases. Article on the Xenoblade Wiki.